Lung cancer is the most common cancer in the world and the leading cause of cancerrelated mortality (12.6% of all new cancers, 17.8% of cancer deaths). There were an estimated 1.2 million new cases and 1.1 million deaths in the year 2000. The high mortality is mainly due to early development of systemic disease and resistance to currently available chemotherapy. Men have seen declines in incidence and mortality rates in the last ten years, which is associated with reduction in smoking. This is not the case for women, among whom these rates continue to increase. Whether this increase suggests a higher gender-related risk of lung cancer for women or merely reflects changing smoking patterns remains controversial. Almost all lung malignant tumors are carcinomas (other histological types are < 1%) broadly divided into smallcell lung cancer (SCLC), comprising 20% of lung carcinomas and non-small-cell lung cancers (NSCLCs), comprising ̃ 80% of lung carcinomas. SCLC is a tumor of neural crest origin whereas NSCLCs originate in bronchial epithelial cells or alveolar and bronchioloalveolar cells and represent a spectrum of histological subtypes including squamous carcinoma, adenocarcinoma, bronchioloalveolar carcinoma, undifferentiated large-cell carcinoma and anaplastic carcinoma. NSCLCs do not represent a single pathological entity but a group of diseases with different ‘molecular signatures,’ and consequently different biological features. 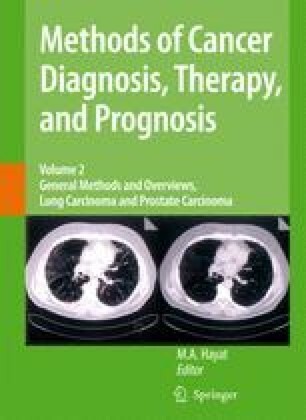 Genetic models for the development of SCLC and NSCLC have been recently proposed (Yokota and Kohno, 2004; Testa and Siegfried, 1992), and it is becoming clear that the failure of conventional cytotoxic chemotherapy to treat advanced NSCLCs, observed in the last two decades, likely reflects the biological and molecular heterogeneity of these tumors. Although surgery represents the best therapeutic option with potential for cure in patients with early-stage NSCLCs (̃1/3 of the cases), the treatment of metastatic NSCLCs is still a challenge (Tables 20.1 and 20.2). Approximately, 50% of patients with stage IV disease are incurable with currently available chemotherapy. Several chemotherapeutic agents have been developed in the last three decades for the treatment of NSCLCs, but randomized trials of platinum-based combinations seem to reach a therapeutic plateau with an objective response rate of 26–46% and a median survival time (MST) of 7–11 months for patients with stage IIIB or IV disease (Table 20.2) (Abeloff et al., 2004). In general, cytotoxic chemotherapy results in a modest increase in survival at the cost of significant toxicity to the patient.